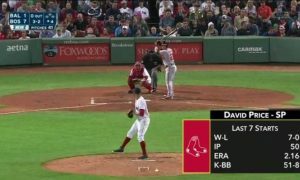 Boston Red Sox designated hitter David Ortiz hit his 500th home run of his career off of Matt Moore of the Tampa Bay Rays in the top of the 5th inning at Tropicana Field. Ortiz became just the 27th major league player to reach the feat, the fourth Red Sox player and the fourth Dominican Republic native to reach the historic mark. The home run was Ortiz’s second of the game and the left-handed slugger now has 34 homers on the season. The 39-year-old has gone on a power surge since June 10, when he had just six home runs and was batting a weak .219. He’s now hitting a slash of .271/.358/.542 with 94 RBIs to go with his 34 home runs. Eddie Murray‘s 504 homers are next up for Ortiz, as he looks to move up to number 26 on the all-time list.